Valentine’s Day is right around the corner. You can be a sweetheart and purchase gorgeous artisanal chocolate from Virginia’s own Gearharts Chocolates, made with Shenandoah valley cream and butter and finished by hand. Or, you can get ambitious and impress your beloved with homemade fruit and nut chocolate bars with today’s easy to follow directions. Or, you can do both, doubly endearing you to your chosen recipients. Today’s post was inspired by David Lebovitz, an American pastry chef, author (see The Great Book of Chocolate) and expert blogger who writes of his Parisian sweet life adventures. In a recent post he walks us through the steps of making chocolate bars without the involved and at times cumbersome process of tempering, which gives fine chocolate its gloss and snap. You may, of course, choose to temper your chocolate but my method, adapted from Lebovitz, results in bars with similar characteristics and none of the fuss. He asserts that untempered chocolate must be stored in the refrigerator until shortly before enjoying, mostly because these chocolates are more likely to melt in your hand. My bars have stayed stable at room temperature, but in a very warm home or during the summer months they will likely perform better in the fridge. Molds made from plastic are easy to use and easy to find. Lebovitz uses charming empty Parisian cream cheese containers, forgoing his fancy culinary grade polycarbonate chocolate molds. I found these nifty BPA-free two ounce containers at a local dollar store. They are perfect for two-bite confections. Metal molds require chocolate that has been tempered, so the bars will pop out easily (tempering allows slight shrinkage). You will need high quality chocolate for this project, dark and up to 72% cacao, and in bar form. Chocolate baking chips will not do; they are formulated to stay firm after baking, so the mouth feel will be waxy and unpleasant. Scharffen Berger makes great artisanal dark chocolate, manufactured in America, and Trader Joe’s carries a smooth Belgian dark chocolate bar which is both high quality and good value. 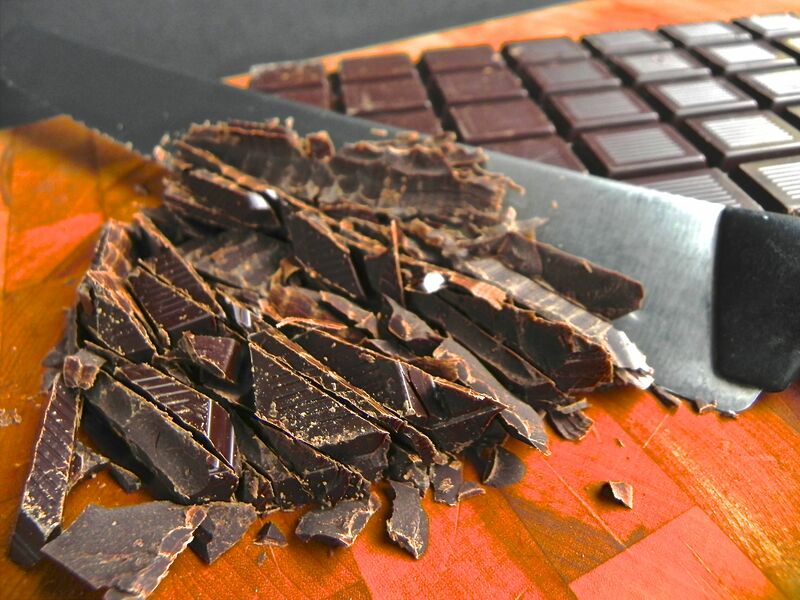 Cut your chocolate bars with a large serrated knife to avoid bits of chocolate flying cross your kitchen. An endless selection of bar toppings awaits your approval. Dried fruits and lightly toasted nuts are a toothsome and less-sweet contrast to the richness of chocolate, but you may choose Valentine’s themed hard candies, crushed bits of candy bars like toffee or mint and flakes of sea salt (I like Maldon). Today I am using tart dried Montmorency cherries, uncrystallized ginger and toasted slivered almonds, all from Trader Joe’s. Making these chocolate bars can be a gloriously messy affair. This allows one to perfect the art of licking bowls, spoons and spatulas. Not such a bad way to suffer for art’s sake. I am not specifying amounts of ingredients because number of bars will be determined by size of molds as well as depth of chocolate in your molds. For the pictured bars, one pound of chocolate yielded twenty. Store untempered chocolate bars at room temp in a cool environment away from heat sources or sunny windows and enjoy soon, or store tightly covered in fridge and enjoy later. This entry was posted in desserts, gluten free, vegan, vegetarian, winter and tagged chocolate bars, fruit and nut chocolate bars, homemade chocolate candy bars on February 8, 2013 by Michele Humlan.